Since I saw the pictures of the Bugaboo splitter cracks soaring above glaciers, I’ve been wanting to go to the Bugaboos. 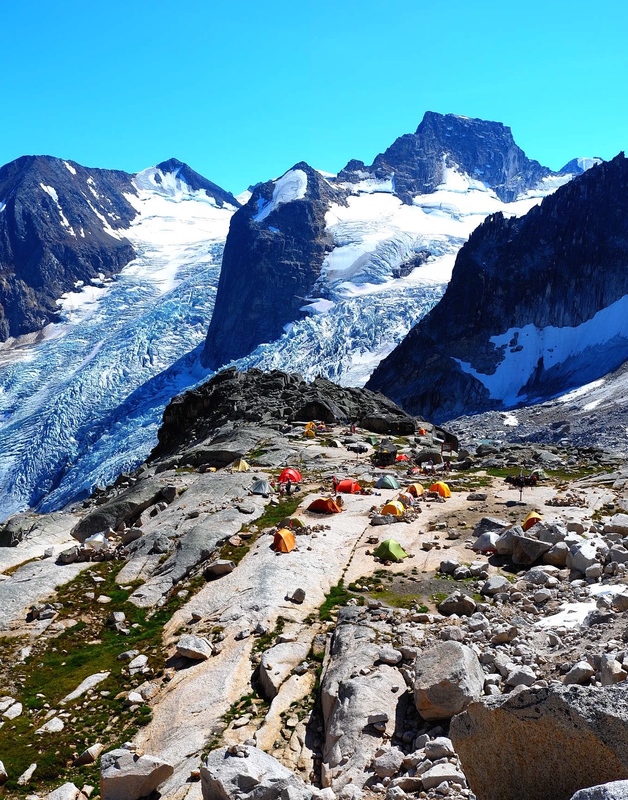 Bugaboo Provincial Park is one of the best alpine climbing destinations in the world. Large solid granite spires that have a variety of quality cracks. Beautiful views of alpine lakes, glaciers, and surrounding alpine peaks. Last summer was my first alpine climbing season so I took a couple courses and gained experiences in the alpine before heading to the Bugaboos. 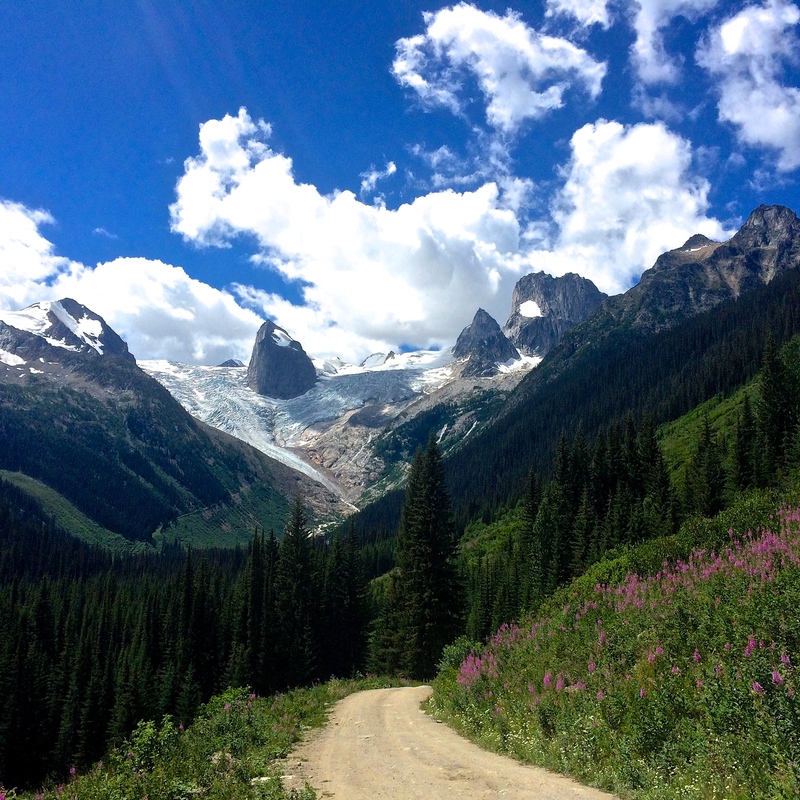 Then, I finally made a trip to the Bugaboos for a month, July 19-August 14, 2015. Without any experience in alpine, I wasn’t quite sure how different alpine climbing would be. I had never used crampons or ice axes so I definitely needed to learn glacier travel and crevasse rescue skills, but what else? I would be climbing on much easier grades, I wasn’t worried about the climbing part…until I realized how much of a difference it made to climb with a heavy pack, on loose rocks, with more challenging route finding. I normally don’t bring packs for multi pitch climbing, and if I do, I try to carry as little as possible. With glacier gear, heavier boots, and extra layers in case for the weather change made my pack much heavier. I was getting exhausted climbing 5.10s. This was the most significant change in alpine climbing from what I was used to. In addition, there were more loose rocks that I had to pay extra attention to what I’m holding and stepping. Climbing in a terrain that you can’t trust what you’re holding on, stepping on, or even your gear was mentally exhausting. I had trouble with route finding on some climbs as well. Alpine climbing guidebooks won’t have detailed picture showing each pitch with rock features. Route descriptions can be very vague and some routes are not obvious. Technical Rope Rescue Course (Raven Rescue): This course was designed more for Search & Rescue. I wasn’t planning of taking this course for alpine climbing, but I had the opportunity to take it. This course helped me better understand crevasse rescue hauling systems. Here is my blog post about the course. Crevasse Rescue/Glacier Travel Course (Canada West Mountain School): With this course, I learned and practiced drop loop crevasse rescue system, traveling through crevassed terrain, and self arrest. 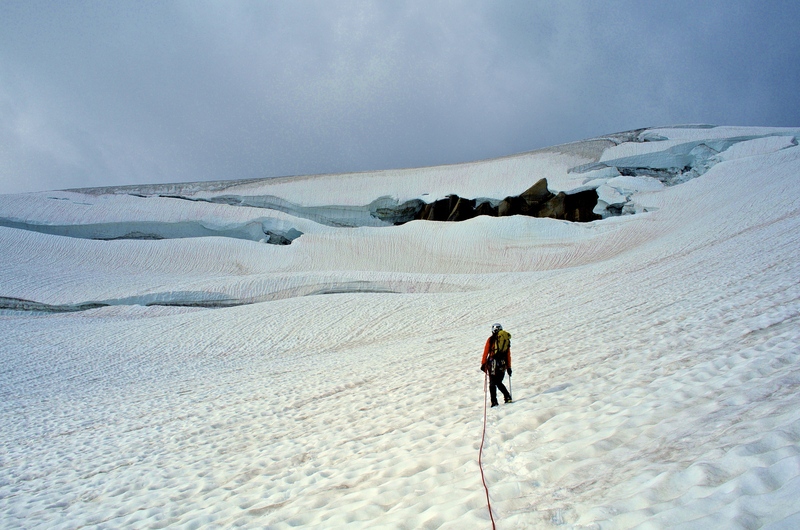 Most summer mountaineering crevasse rescue courses start in May. West Buttress, Sky Pilot (PD 4th): Roping up for traveling in glaciated terrain, use of crampons and an ice axe, self arrest. 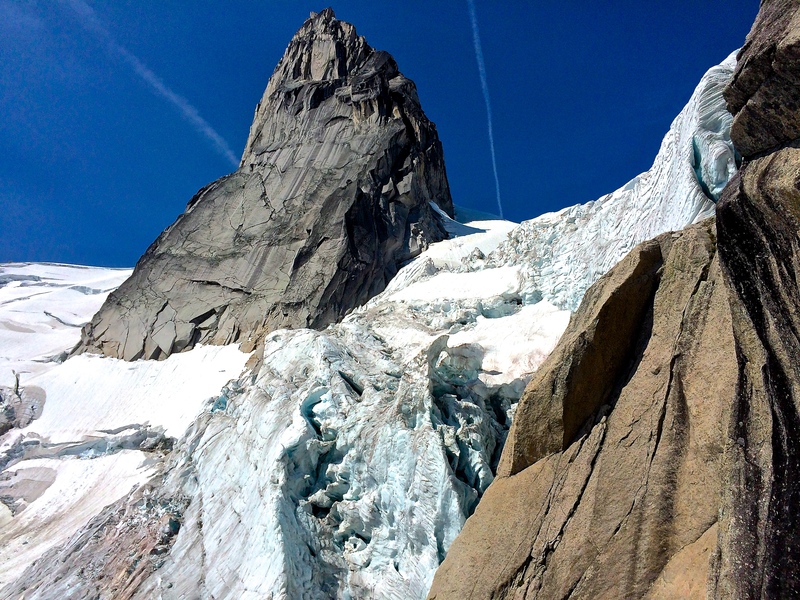 Springbok Arete SCE Direct, Les Cornes (TD+ 5.10c): Route finding in the alpine, climbing with a heavy pack. North Rib, Mt. Slesse (TD 5.9): Glacier travel, route finding in the alpine, climbing with a heavy pack, long climbing/descent day. Life on Earth, Mt Habrich (D+ 5.10c): Route finding in the alpine, climbing with a heavy pack. Also, my training’s focus shifted from building upper body strength to leg strength and overall fitness. My program consisted of weight training with dumbbells and a variety of squatting exercises. I also hiked the Chief (1.5km, 540m elevation gain) once a week with weights to train for carrying heavy weights. After All these preparations, I felt I was ready for the Bugaboos. Drive to the Bugaboos from one of the nearest town, Golden BC, was about 2 hours. At the end of an-hour-drive on the dirt road, I was so excited to see the Bugaboo granite spires. We wrapped our cars with chicken wire and wood posts to protect them from rubber eating porcupines and headed up the trail with our 60+ pound backpacks. The hike to Applebee Camp is only 5.6km, but with 970m elevation gain and a heavy pack, it took me about 4 hours to get there. Since my climbing partner and I had some friends joining for a couple weeks, we both had enough climbing gear to partner up with anyone at the camp. Some climbs required more than a single rack or two ropes, but climbing partners I met at the camp had some gear as well so the amount of gear I had was enough. For food, I chose dehydrated meals for this trip to save weight and fuel. We hiked back to our cars on day 5 to resupply our food for the rest of the stay. Since I get cold easily, I also brought a warmer pair of soft-shell pants and a bigger Prima Loft jacket on the resupply day. Once I arrived at Applebee campground, I quickly set up my home for the month and went around to check the surroundings. I could see the condition of the Bugaboo-Snowpatch Col from Applebee. Since the winter leading to last summer was dry, followed by a warm spring, I knew snow on the col had been melting. Snow holds loose rocks on the col and make it safer to travel. I was hoping there would be some snow left to the top of the col. When I arrived at Applebee, however, I couldn’t spot a line of snow to the top. I’ve talked to some climbers who had used the col but none of their feedbacks were positive. The Bugaboo-Snowpatch Col is the main access to many climbs and I wasn’t sure how else to get to the other side of the park. After talking to other climbers at the camp and looking through the guide book, we realized that we could access the Pigeon Spire and the Western Spires (the Howsers and Pigeon Feathers) by going around the Son of Snowpatch, and traveling up the Bugaboo Glacier and the Pigeon Fork Bugaboo Glacier. This would make our days longer, but it was a much safer alternative to the Bugaboo-Snowpatch Col. Since the Pigeon-Snowpatch Col Icefall area could only be descended with rappel stations (couldn’t be traveled up), accessing the west side of the Snowpatch Spire would take much longer than traveling through the Bugaboo-Snowpatch Col. We would have to either go around the Pigeon Spire or climb the Snowpatch Route and decend the Kraus-McCarthy to get to the base of another climb. I woke up to the sound of rain on day 2. I’ve heard it could rain for a week/weeks in the Bugaboos so I wasn’t surprised that it rained most of the day. The forecast (yes, we get weather forecast in Applebee, thanks to awesome custodians who update the forecasts everyday!) for the next couple days looked good and we decided to start with less committing climbs around Applebee to get used to the climbs in the Bugaboos. 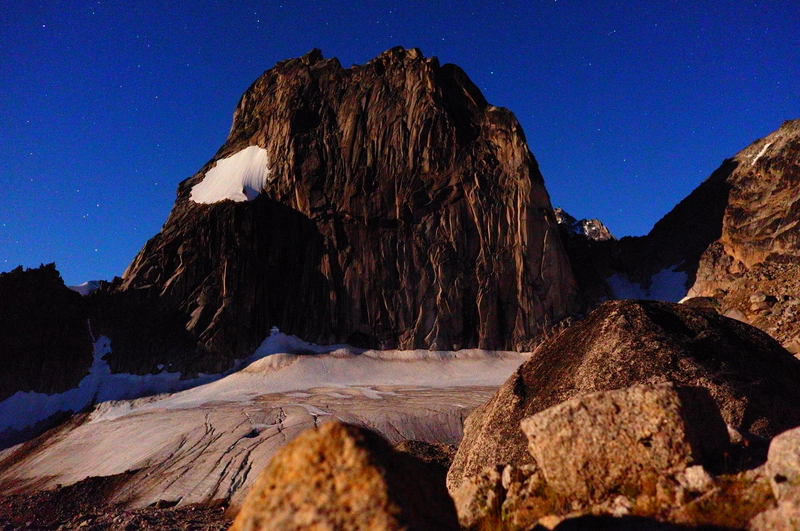 The Crescent Tower, Crescent Spire and Eastpost Spire are great “cragging” in the Bugaboos. The weather forecast was calling for rain on day 5, so we hiked down to the parking lot to get dehydrated food for the rest of the stay and extra layers that we left in our cars. Having the resupply day within a week was a key. I couldn’t imagine hiking with a heavier pack than I had on the first day. It isn’t an exhausting hike to Applebee if you don’t have a heavy pack. I would plan a resupply day if I were to stay there for more than 10 days. After the resupply day, we did the Pigeon Spire to scope out the conditions of glaciers and rappels from the Snowpatch Spire. 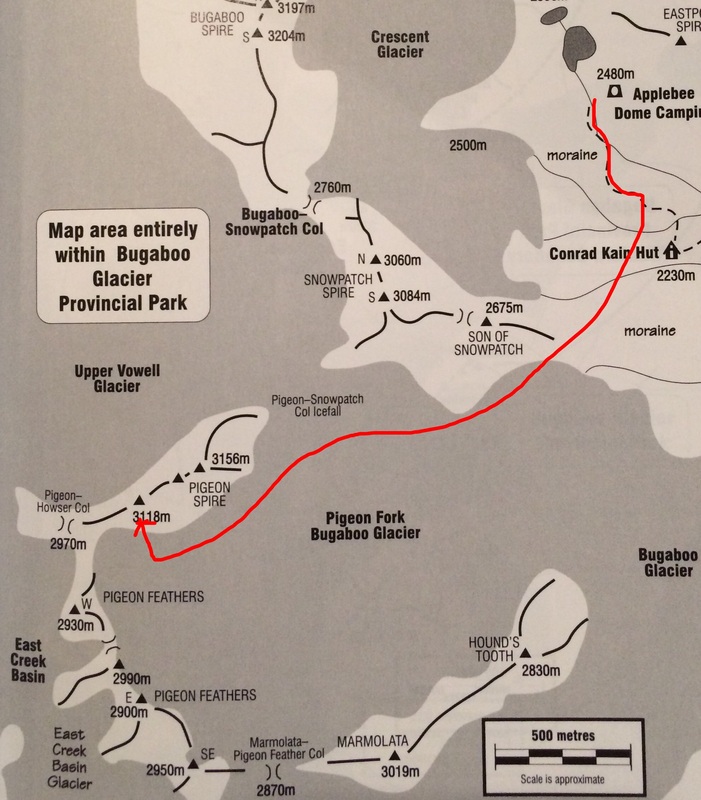 Since we decided not to take the Bugaboo-Snowpatch Col, we would be traveling on the Pidgeon Fork Bugaboo Glacier to get to the Howsers, and also from the Snowpatch Spire and the Bugaboo Spire after rappelling the Pigeon-Snowpatch Col. The Pidgeon Fork Bugaboo Glacier was mostly soft snow condition with some icy sections. There were many open crevasses and some thin snow bridges, but we definitely could travel on it. When we got to the Pidgeon Spire, we did the West Ridge. Despite of cold windy weather, I really enjoyed the route. It was the best 5.4 I’ve ever done. Glacier travel on snow. Big Open crevasses. After I checked the condition of the Pigeon Fork Bugaboo Glacier, I chose climbs according to the forecast. Longer committing routes on a day without a chance of rain, and shorter or less committing routes (routes with short approach and option to rappel down) on days with light chance of rain. The weather in the Bugaboos is not predictable ahead of time. It definitely was nice to have a month there so I didn’t have to stress about the weather. I took some rest days throughout my stay in the Bugaboos. I did yoga and rolled my shoulders with a lacrosse ball. I had a shoulder injury so I tried to take care of it as much as I could. For longer rests, we hiked down and drove to Golden a couple times for showers and to re-supply with fresh food. We planned these rest days when we had storms in the Bugaboos. Each time, we stayed in Golden for a few nights. We also had some days that we were forced to take rest at Applebee due to the rain. Having a book (or kindle) was nice for days spending all day in a tent. Taking care of my shoulder on my rest day. Climbing in the Bugaboos definitely opened up my world of climbing. As much as I enjoyed being in the alpine, I had several moments that I got nervous and was at the edge of my comfort zone. Being on a steep icy glacier where if I slip and can’t self arrest, I probably would die or get severely injured. Crossing huge crevasses with thin snowbridges and seeing a spot where I heard a climber recently punctured a hole while traveling on it. Belaying my partner and having a softball sized rock landing 3 inches away from me. Hearing a news of a helicopter rescue, due to an unpredictable weather change, that climbers had signs of hypothermia and frostbites. It is a wild place. And it is why (not just the amazing Bugaboo cracks) this place was so special to me. I was exposed to many things I wasn’t used to and now I have more on my skill set. While I was in the Bugaboos, I heard lots of stories of even wilder places such as Patagonia. I’m planning more trips to alpine this year to build up my experiences and working towards my next objectives. Sound of the glaciers breaking was something I’ve never heard. I remember being woken up in the middle of the night with the sound. Now being back in town, I’m missing the loud tumbling sound of glaciers. Details on this post are things I was concerned about and asked around before I went on the trip. The Bugaboos is amazing, and I hope this helps someone wanting to go to the Bugaboos or climb in the alpine.